A few weeks ago I brought you the super exciting news that Snuggy Baby- a company best known for their adorable baby carriers and wet bags had just launched their newest product- an innovative new all in two cloth diapering system! I was lucky enough to be one of the very first mamas to try these adorable new diapers out and today I'm excited to share the details with all of you! First up, let's talk about the design and fit. As I said before these are an all in two diaper system featuring adorable covers and absorbent inserts, sold separately. . But how do they work? You just snap the insert into the waterproof cover and when it's time to change baby, you can wipe the cover clean and replace only the insert. This is probably my favorite type of system personally. They take up less space, lead to less laundry and of course are more cost effective. The covers are one size fitting babies from 8-35 pounds. As seen in many one size diapers, they offer 4 rise settings and crossover snaps to allow for the perfect fit for the smallest of babies. But unlike every other one size diaper out there, these also feature a wonderful new crotch and bottom snap system that actually allows you to adjust the WIDTH of the diaper. A common problem with one size diapers I found was that when our daughter was much smaller, they would fit in the rise and around the waist, but were just very wide and bulky- some to the point of looking uncomfortable even. While our girl no longer would need to use this feature, it would have been very handy earlier on. This truly sets this diaper apart from all the competitors! The inserts are also very unique. Their shape allows for a great, trim fit as well as faster drying times. They snap and tuck into the diaper, keeping them in place easily. The jersey material keeps baby's skin feeling dry and is not only super soft on baby's skin, but also very absorbent as well. And for added absorbency, the newborn insert snaps in for a perfect booster! And while the covers are designed to be used with the inserts, they also serve as great general covers as well. You can use them over prefolds, fitteds or even inserts from similar systems (just remember not to have microfiber inserts directly against baby's skin. I tried this out myself and found that it worked quite well- this is great for mamas who already have a good size stash of inserts and are just in the market for some adorable covers! 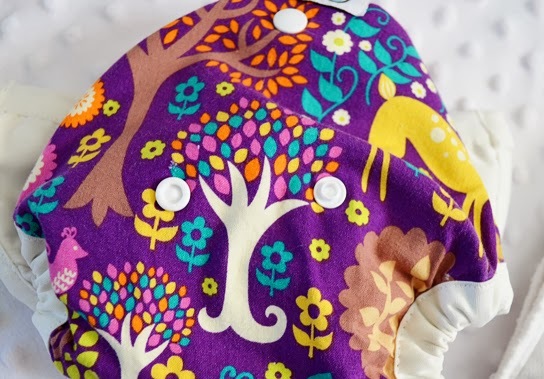 One of the first things that attracted me to Snuggy Baby in the first place was all the gorgeous prints on their wraps...the diapers are no different, featuring a fabulous variety of fun prints. I absolutely love the Fantasy Forest cover we received, as well as many of the other available options like Pink Paisley or Rainbow Chevron. (And for little boys the Moustaches and Pow prints are absolutely perfect!!) I look forward to the summer months so that I can just put Finley in a cute coordinating top or legwarmers and let the diaper be seen! It's seriously too cute to cover!! I mean, seriously...could this be any cuter? And Snuggy Baby has generously offered my readers a special discount through the end of the month! Just use the code FAIRYTALE at checkout to receive 10% off your total purchase... whether you're looking for a new wrap, a wet bag or some fun new diapers, you don't want to miss out on the deal! That diaper is adorable! We just started cloth diapering a few months ago and I'm still looking at different styles and brands! Though my days of changing diapers are over I would have liked to give something like this a try. I love your photos - the first one is just precious. i love that system! and your baby ... gooooooosh how adorable!